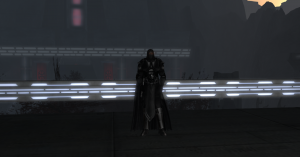 GNW Editor Kinsashala traveled to the Shadow World Umbara, as world in the Expansion Region of the Galaxy known for the lack of sunlight on its surface. 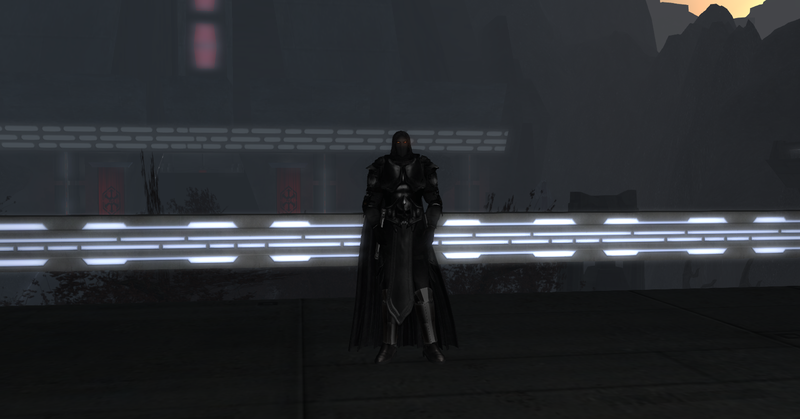 GNW spoke to Rurik Gra’tua better known as Darth Morsus Leader of an Ancient Sith Order called the Order of the Dark Lords who have made Umbara their home. When asked whether the Order of the Dark Lords were allies of the Byss Empire Darth Morsus informed us that at this moment they stand alone but are willing to make allies. The Order of Dark Lords is focussed on growing again after losing many in the wars and their immediate plans include resuming the Ancient Academy at Umbara. Darth Morsus declared that they would welcome all Sith looking for a home. 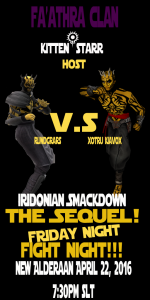 Iridonian Smack down! The Sequel! This will also involve Mythos dropping in to visit other worlds to interact with the citizens there. Not only will Mythos just be training they will also be a helping hand to the Empire if the Empire should be attack. Xotru Klavox, the Independent ship Captain accomplished the seemingly impossible task of defeating the 4-armed Besalisk contender Vong Jurr. 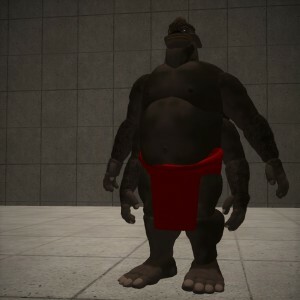 While Vong-Jurr did display impressive skill and at one time convinced the audience to bet on him winning, Klavox came up with an astounding display of cunning, agility and strength, using the Arena walls to rebound off of and launch devastating attacks which finally felled his huge opponent. 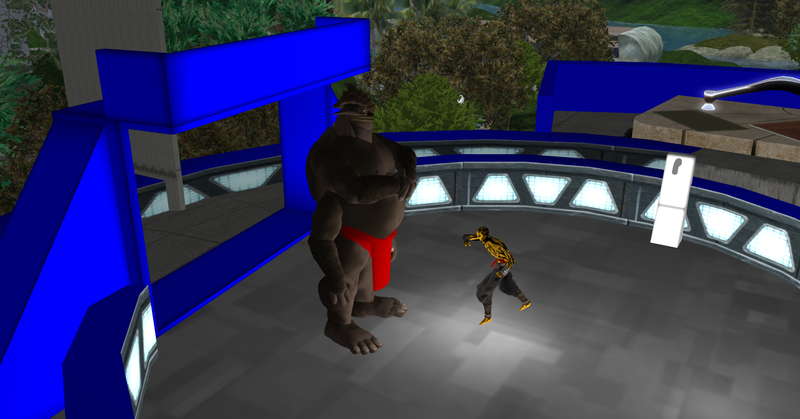 While Klavox drew first blood in their encounter, the Besalisk used his natural advantage of 4 arms to get in some deadly punches, however Klavox managed to knock the big guy off his feet which swung the match in his favor. The fight then hung in the balance with a number of bets rushing in as Vong Jurr tried to counter attack. Captain Klavox however managed to endure and withstand the deadly onslaught much to the surprise of the audience. The noble Hutts in attendance included Shaka the Hutt from Byss, Javik the head of the Fa’athra Clan and Dr. Cabassoun the Hutt scientist. Klavox then thrilled the audience with his maneuvers, darting in between the humongous Vong Jurr’s legs and landing crunching punches and kicks. 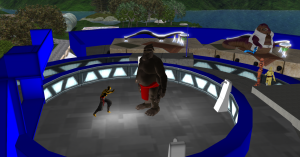 The Iridonian Captain found his rhythm and finished off the fight with a lethal kick to the head sending Vong Jurr to the mat and causing the Arena to burst into a standing ovation. We wonder if there is indeed anyone who could defeat Captain Klavox as he has beaten all comers. 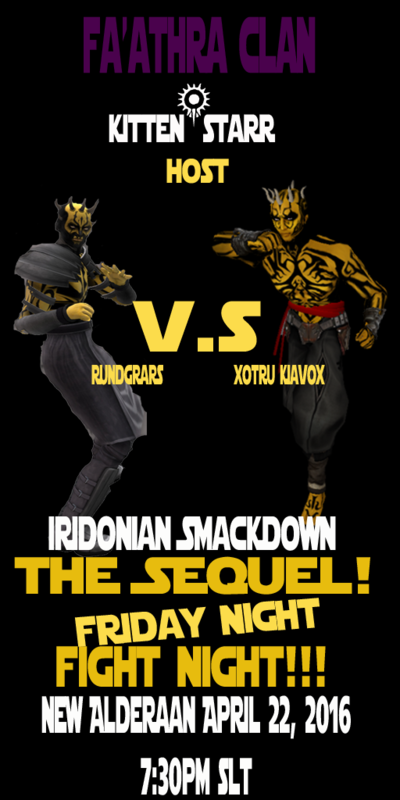 A rematch with his fellow Iridonian Rundgrar seems all the more interesting now though few would back the challenger given Klavox’s outstanding record. However if Rundgrar does get a rematch it would be a bookies delight given the interest these matches have had with the punters. 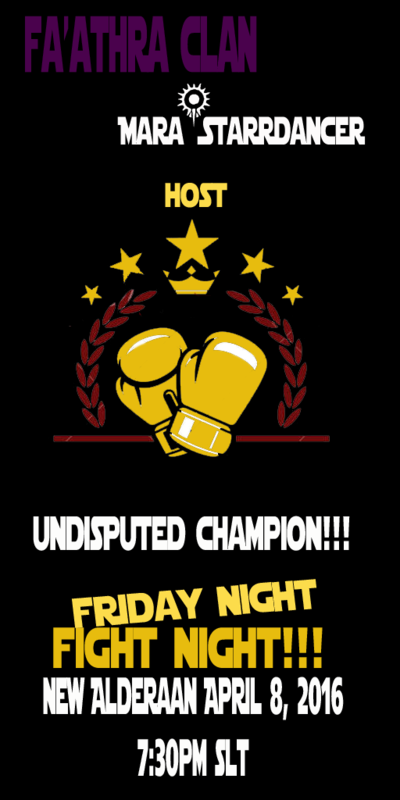 Stay tuned for Fight Night as GNW updates you on the quest to find the Ultimate Galactic Fighting Champion! 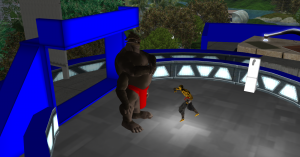 Captain Klavox the undefeated Fighting Champion will have his hands full tonight at New Alderaan’s Fight Night [7:30 pm SLT] when he faces off against the Besalisk fighter Vong Jurr. GNW headed to Athiss a Sith controlled world to interview the fighter. 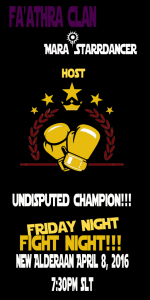 GNW: How do you rate your chances in tonight’s fight? Vong Jurr: I have a significant height, weight and reach advantage, I believe I am the favorite. Vong Jurr: I am a trained fighter, I have spent years training and fighting some of the best fighters in the Galaxy, plus instead of two fists Klavox will have to contend with 4!